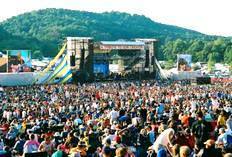 The "Creation Festival" is an annual 4-day Christian outdoor music festival. It's a 4-day outdoor music festival in June that provides camping facilities, amphitheater, live gospel concert and fellowship. Bring your campers or just spend a day, it's a heartwarming experience your family will want to attend year after year. It's located on the Agape Farm in Mount Union, PA.
You'll find beautiful forest and lush green grasses surrounding the several hundred acres of campgrounds. Meet people from all over the world who make a pilgrimage to the Allegheny Mountains to enjoy one common thread, to hear and sing The Word of God! This festival has grown to be the largest Christain Music Festival in the world! 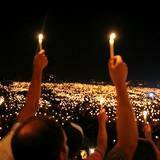 Even though thousands of people attend this famous Pennsylvania festival, you can feel secure knowing your family will be safe and protected from all your concerns, even the weather. Bring your lawn chairs or bring a blanket, not matter where you sit you'll have a perfect seat to listen and watch the festivities at the base of a three hundred foot mountain. It's a natural amphitheater that is used for the main stage area. A forest trail winds to a peak of this mountain, which provides a magnificent view of the valley below. Where else in this world can you bring your family and enjoy listening to a fantastic live rock concert, the best gospel music, Christian speakers, enjoy meeting people from all over the world, all this while camping in the Allegheny Mountains, under the stars? From the Pennsylvania Tpk, Exit 180 McConnellsburg/Mt. Union, take Rte.522 North for 26 miles to Shirleysburg. Continue ? mile, cross over bridge, immediately turn left onto Keystone Road (Lr31029). Continue 3.1 miles to Agape Farm Main Entrance. Note the Main Entrance is normally closed except during large events. To Campground: Follow the directions above to the Main Entrance, pass Main Entrance, turn left onto Spidertown Road (T348) for 1 mile. Turn right onto Hallelujah Highway, proceed ? mile to campground. From Mount Union: Take Rte. 522 South for 6 miles to the bridge. Do NOT cross bridge. At north end of bridge, turn right onto Keystone Road (Lr31029), continue 4 miles to Agape Farm.